Creativity is the ability to approach challenges in a spirit of discovery and enquiry, and to carry out tasks using imagination and predictive and creative thinking. It is an ability that can be used to shape reality. Thinking and acting creatively is linked with cognitive processes such as problem-solving strategies and flexibility Children have incredible potential for creativity, because they naturally experiment using trial and error. Finding solutions for tasks and problems on their own, for example, enables them to practice their creativity. 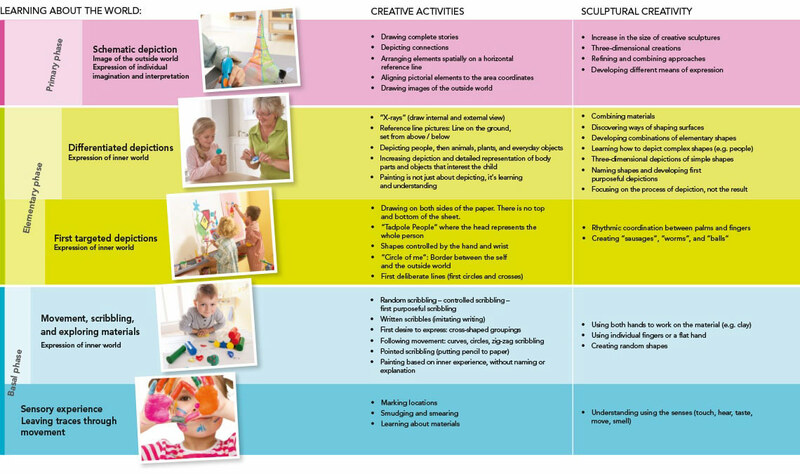 Activities like drawing or sculpting are key for developing thoughts and feelings. Free experimenting and creating supports complex thought operations and problem-solving skills, and promotes freedom of expression and self-awareness.